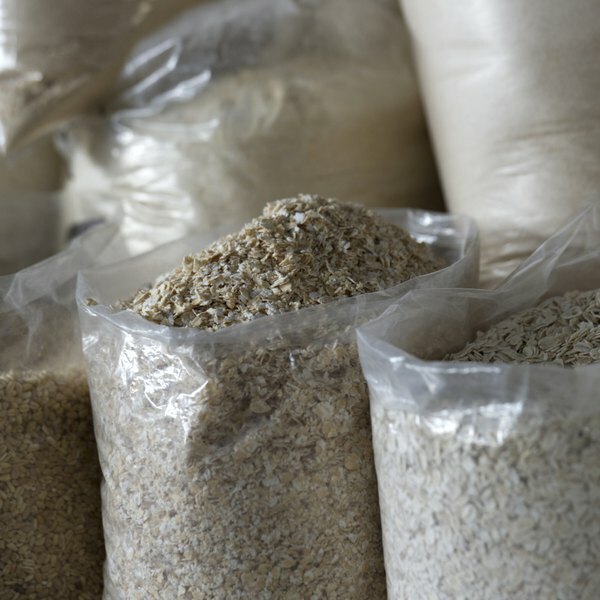 Rice flakes undergo more processing than any other type of rice. Processing begins by parboiling to partially cook the rice via steaming, followed by a process of rolling, flattening and finally, dehydration. The result is “rice” with a soft, mushy texture when cooked and a taste so mild it borders on bland. The nutritional value of rice flakes is similar to that of its intact counterparts. Brown rice flakes are a good source of fiber and iron, while the nutritional value of white rice flakes depends on whether processing also includes enrichment. Pour 1 1/4 cups of water or broth in a saucepan for every 1 cup of rice flakes you plan to cook. Turn a stove burner to high heat and bring the liquid to a full boil. Stir in the rice flakes and cover the saucepan. Reduce the heat to medium and without stirring, simmer the rice flakes just below boiling point for 5 to 8 minutes, until the flakes absorb all the water in the saucepan. As an alternate option, stir in the rice flakes, cover the saucepan and transfer the pan to a wire cooling rack. Let the rice flakes sit for 10 to 15 minutes or until the flakes absorb all the liquid in the saucepan. For better flavor and improved nutritional value, add raisins or small pieces of dried fruit during the last 3 to 5 minutes of cooking, or season cooked rice flakes with a sprinkling of cinnamon and chopped nuts.